At Connectivity we constantly push the limits of the technology world to provide innovative wireless callboxes, callbox networks, wireless video solutions, and wireless broadband for our customers. From the patented design of our callbox line, which operate over all frequency ranges, to the unique features of our video and broadband lines, these versatile wireless products benefit a wide range of industries including homeland security, education, transportation, corporate, military, manufacturing, and recreation. 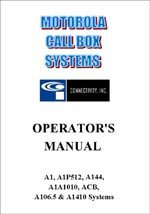 Connectivity's callbox systems can also be purchased throughout North America at our Authorized Agent locations. Select models are also available through your local Motorola Dealership as indicated in the product index area.